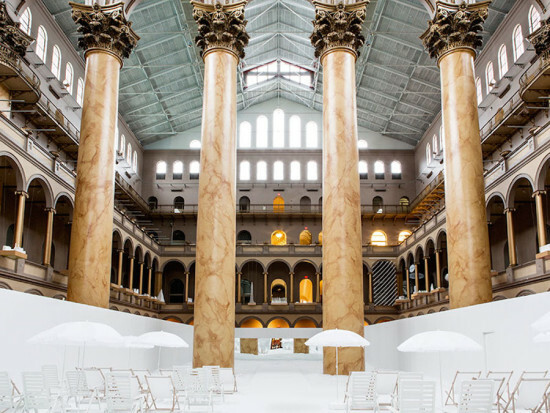 The magnificent, four-story Great Hall of the National Building Museum is now a site for executing cannonballs, rolling on the floor laughing, and other acts of gleeful revelry. A giant ball pit filled with recyclable translucent plastic orbs cuts between the colossal Corinthian columns, bounded by an enclosure made from scaffolding, wooden panels, and perforated mesh all painted stark white. A mirrored wall at one end creates the illusion of an unending abyss of translucent orbs. Bordering the enclosure is a 50-foot “shoreline,” filled with umbrellas and monochromatic beach chairs for lounging in the sunshine that filters through the window-laden ceiling four stories above. Adults can recline on “dry” land with a book, play paddleball, or have a drink at the snack bar. 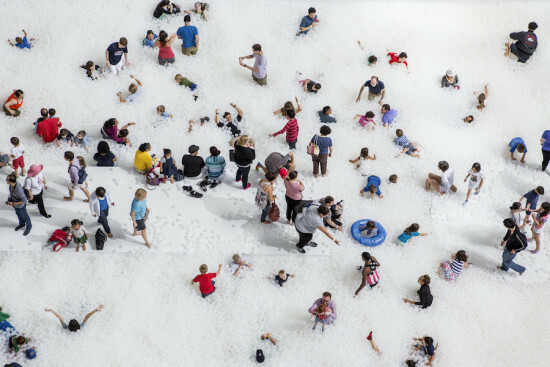 The installation, titled The BEACH was dreamed up by Brooklyn-based design firm Snarkitecture, which bills it as “an exciting opportunity to create an architectural installation that reimagines the qualities and possibilities of material, encourages exploration and interaction with one’s surroundings, and offers an unexpected and memorable landscape for visitors to relax and socialize within.” The fun-fest is part of the National Building Museum’s ‘Summer Block Party’ series, which last year hosted Big Maze by the Bjarke Ingels Group. Visitors wandered through an 18 foot-high maple plywood structure inspired by ancient labyrinths, garden and hedge mazes of 17th and 18th-century Europe and modern American corn mazes.